Sometimes tadpoles die before they can change into adult frogs. Tadpoles die from natural causes, injuries, contaminated food, contaminated water and other reasons. You cannot take a tadpole's pulse, as you would for a dog or a human, but you can look for some key indicators of death. The bigger a tadpole is, the easier it is to see if it is dead or not. Remember that these steps are only for tadpoles and not frogs, or frogs that still have a small tail. Observe the tadpole. A healthy, living tadpole should swim around in the water. Its tail should always move. If the tadpole doesn't move its tail for 15 to 20 minutes and it is floating somewhat lopsidedly in the water, it's dead. 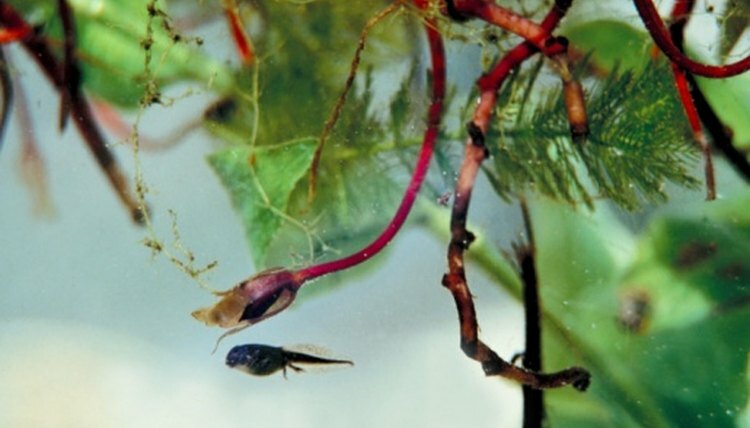 A dead tadpole might sink to the bottom of the tank, according to Aquatic Frogs (aquaticfrogs.tripod.com). Stand or kneel so you are eye level with tadpole. Look for its gills. The gills move when it's alive. Agitate the water six inches away from the tadpole. If the tadpole doesn't react, it's dead. Scoop up the dead tadpole with a fish tank net. Throw the tadpole away. The Victorian Frog Group; Keeping Tadpoles: A Guide for Pond Dwelling Species; Joanne Doherty, et al.